The current therapeutic regimens have tried to prevent the complications of these diseases through the inhibition of the disease causing products like aβ-plaque formation in the Huntington’s disease or the replacement of the dopamine cells in the substantia nigra of the mid brain in case of Parkinson’s disorder. However, all these therapies have provided very short term relief from the problems and the long-term benefits are still far away. According to recent findings, significant association between the gut activity and the brain functioning including behavior and emotions has been established. The activity of the gut microflora in the modulation of the brain response is increasingly been implicated. In the first place it is very difficult to believe that there can be any association between the resident microbes of the intestine and the CNS but there are data which suggests that during acute cases of microbial gastrointestinal infections it is indeed the case. This kind of informations suggested for a greater implication in the gut-microbiota brain axis. In case of C. jejuni infections, anxiety type behavior originated via the vagal pathways. This kind of communication between the gut and the brain augurs well for the health of the humans as the beneficial microflora can find greater implication in the alleviation of brain related complications. We are just at the tip of the iceberg with regard to our knowledge about the interaction between the gut microbiota and the central nervous system and the modulatory effects that the microbes can have on the brain. One of the ways that the human behavior could be affected by the beneficial flora is by the innate immune response activation. It has been now an established fact that the acute cases of infection and the resultant inflammatory responses could induce cytokine related behavioral pattern of the brain that could lead to anxiety, depression and cognitive malfunction. It is a matter of great interest to find the normalizing effect that the administration of Bifidobacterium longum strains could cause on the behavior of the host under such extreme cases through the alteration of BDNF expression and not the innate immune responses. This shows that the probiotics can have direct beneficial modulatory effects on the CNS through the interference with its metabolite production and release. Are The Bacteria Involved in Memory? A published report in the journal Gut, has investigated for the involvement of the bacteria in the process of learning and memory. In this work Gareau and his team have shown that the prior administration of probiotic strains like L. helveticus and L. rhamnosus could inhibit the memory deficits that may arise due to some chronic infections. The mechanism of action for such beneficial effects was delineated and was linked to the normalization of activity of myeloperoxidase, lowered expression of cytokines and corticosterone and reduced levels of hyperplasia. The results were on similar track with previous finding which states that corticosterone could affect BDNF expression. 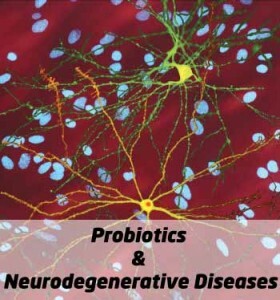 The potential role of the probiotic bacterial strains in the alleviation of problems associated with neurodegenerative diseases have been investigated recently in a number of studies. According to a recent report published in the journal Applied microbiology and Biotechnology, the probiotic strains like B. animalis, L. acidophilus, S. thermophilus, L. brevis and Lactococcus lactis possessed anti-oxidant properties through the production of oxygen scavenging enzymes like superoxide dismutase. Therefore, they could limit the damage caused by the free radical exposure of the human tissues. The neurodegenerative diseases encounter increased levels of ROS generation and the application of anti-oxidants has been found to be quite beneficial in providing relief to the diseased individuals. In yet another study published in Gastroenterology by the researchers at UCLA, it was demonstrated that the probiotic presence in the foods can help modulate our brain functions. According to Dr. Kirsten Tillisch, the principal author of this article, the consumption of fermented dairy products like yoghurt could positively alter the way our brain responds to environmental stress. The regular intake of the probiotic food products that contained the strains of S. thermophilus, B. animalis, L. bulgaricus and Lactococcus lactis resulted in effectuating better responses from the brain regions that are involved with the control of sensation and emotion. In addition, to the long-term beneficial effects that the probiotics can render in the cases of neurodegenerative disorders through the modulation of gut-brain axis there are also short-term benefits that can be exploited with the intake of the right probiotic combination. The probiotics have been already established to be potent producers of important vitamins like folic acid, vitamin C. Many of these vitamins are well known anti-oxidants. With the administration of the proper dosage of the probiotics, the anti-oxidative effects can be applied to the hosts which can be beneficial in the neurodegenerative diseases. In addition, the probiotics could synthesize potent anti-oxidants like polyamines the application of which have been found to be quite effective in many of the age related diseases. Furthermore, the ability of the probiotic bacteria to break down isoflavones into aglycones can be effectively utilized in the aforesaid cases. The other roles of the probiotics like scavenging of reactive oxygen species and the stabilization of the levels of crucial minerals like Calcium can have far reaching effects on the hosts with neuro-pathological state. The probiotics posses all it needs to improve upon the complications faced by the patients suffering from neurological disorders. They can be applied to promote both short and long term benefits under such conditions which open up a really interesting and effective way of therapeutic intervention in neurodegenerative disorders which have otherwise remained largely untreatable.